A German cardboard manufacturer has given Ellesmere Port its seal of approval after investing £74 million to open a new cardboard manufacturing plant in the town. Cllr Brian Clarke, Cabinet Member for Economic Development and Infrastructure, said: “The new state-of-the-art operation will replace the current progroup plant on the Pioneer Business Park, just a few kilometres away. “The site will feature an upgraded corrugated board machine which enables them to meet increased demand and will further secure the company’s leadership in the European corrugated sheet board market. “Progroup’s ambition is to have the most efficient and powerful corrugated sheet mega board plant in the world. This will be further supported by space for an additional building of up to 468,000 square feet for which outline planning has also been submitted. 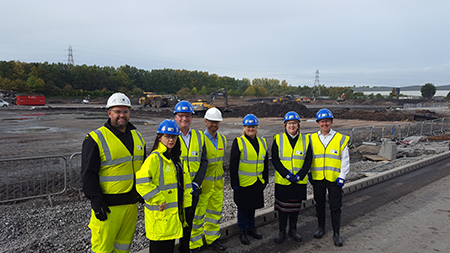 The Cheshire and Warrington Local Enterprise Partnership has also supported the development by investing in primary substation to support development of Progroup and increase capacity for the Cheshire Science Corridor sites on the whole of New Bridge Road.